The Best Books Ever: Exclusive DOON interview with Vee and Mackenna + Giveaway! Exclusive DOON interview with Vee and Mackenna + Giveaway! Today we are super excited to have two lovely ladies joining us! 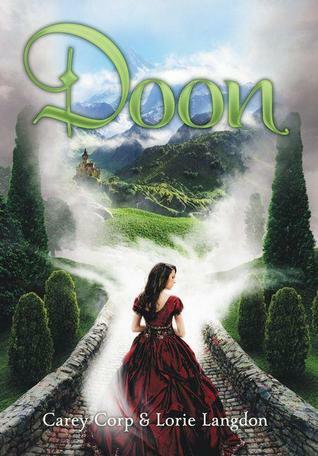 We want to welcome Vee and Mackenna from the book Doon! You are both heading to Scotland- have you been there before Veronica? Vee: This will be the first time I’ve ever been out of the country. I can’t wait to try everything Scotland has to offer…oat porridge, kippers, I might even try haggis. Well, maybe not the haggis. Fried sheep guts sounds disgusting. How about you Mackenna- you took many trips to Scotland as a girl. Is it a place you look forward to visiting? Vee: Oh, sorry. *grins* In my defense, I only had one ear bud in. I was totally listening. So, what music has you so engrossed, Veronica? Kenna, you seem to have different taste in music. What gets you moving? Kenna: I try not to move, as a general rule. But if I have to, it’s probably to something by Sondheim or Marvin Hamlisch. Kenna & Vee: *in unison* Or Les Mis. Kenna: Jinx you owe me a coconut-pineapple-mango, no-whip smoothie! Vee: *rolls eyes* You just have a crush on that guy who played Marius in the Ball State production of Les Mis. Kenna: He had a nice set of lungs. That brings up a fun question…if you could ask any celebrity to Prom who would it be and why? Kenna: Reeve Carney, a.k.a Spider-Man as in Spider-Man: Turn off the Dark. He’s ridiculously gorgeous, has an amazing voice and the boy is straight! FYI—he’s also my answer to who I would spend the end of the world with. Vee: I had kind of a nasty break up recently. Let’s just say I’m not the most popular person in my class right now. Kenna: What about the lead singer from that band we saw at the state fair…Boys Like Girls? You should totally take him, too! Vee: Oh yeah! Martin Johnson...his voice makes me swoon! Speaking of swoon…will you be looking for romance in Scotland? A summer fling perhaps? Kenna: Come on Vee, cute Scottish boys in Kilts. What’s not to like? Okay then, let’s keep it hypothetical. A curse destines you to spend eternity as a movie villain, which villain would you be? Vee: The Evil Queen in Snow White. I love the show ONCE UPON A TIME and the character of Regina fascinates me! Kenna: The witch from INTO THE WOODS—she’s got tons of amazing songs!!! What? It’s a valid answer. The movie comes out Christmas 2014. Your fairy godmother shows up and offers to turn you into a Disney princess. Which one would you choose? Vee: Kenna would have to be Ariel from THE LITTLE MERMAID. She’s got the hair and the beautiful voice! Vee: An Eagle because they’re powerful and majestic, and totally free. And for the hardest question of the day.....if you were stuck on a deserted island what three things would you want with you? Kenna: My bestie, The Best Broadway Songs Ever (4th Edition), and Reeve Carney! Vee: My loaded MP3 player with solar batteries, my books and my BFF, Kenna! Lovely to meet you too, Angela!